United Airlines' mobile boarding pass and mobile check-in programs have gone international, allowing customers to check in using web-enabled mobile devices for overseas flights. Yesterday the airline announced mobile boarding passes will be available to customers departing from airports in London, Munich, Amsterdam, Brussels, Geneva, Zurick, Moscow and Osaka, with plans to introduce the option at additional international airports in the coming months. The paperless boarding is now offered at 62 U.S. airports, including United's hubs in Chicago, Denver, Washington Dulles, San Francisco and Los Angeles. 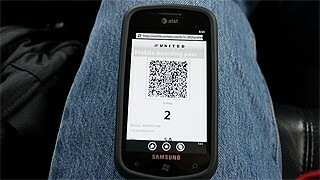 Mobile boarding passes display a two-dimensional bar code along with customer and flight information on traveler's cell phones. Scanners at security checkpoints and boarding gates validate the information the same as a paper pass, and the technology prevents any manipulation or duplication. Besides saving time at the check-in counter and saving paper, an additional benefit of using a mobile boarding pass is that a simple refresh will reflect any changes to seat assignments, gate changes and upgrade confirmations. "The expansion of our mobile check-in feature and paperless boarding option to international travel enables our customers to enjoy even more flexibility and control throughout their travel experience," says Martin Hand, vice president of customer experience for United, in a statement.